GIVE THEM A MEDITERRANEAN INSPIRED NIGHT OUT. Gift your friends, family and co-workers with the fresh, inviting flavors of Mediterranean-inspired Cuisine. Whether it’s to celebrate a big milestone or a simple “thank you,” these easy convenient gifts are perfect for any occasion. 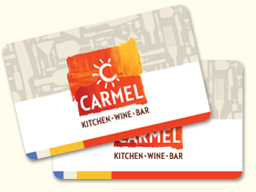 Our gift cards can be purchased in any denomination from $10-$500.